7th Annual Craft Brew and Wingfest for 2018 in Vero Beach. VERO BEACH – The Seventh Annual Craft Brew and Wingfest for 2018 will offer craft beer and delicious food sampling on February 17, from 11:30 a.m. to 4:00 p.m. in Vero Beach. This family-friendly free event will be held at Royal Palm Pointe Park on mainland Vero Beach off Indian River Boulevard just south of the Merrill Barber Bridge. Guests 21 and over, with proper ID’s, can purchase a bracelet at the event allowing them to sample more than 200 Craft and Micro Brews at booths throughout the City Park. Or they can buy single glasses of selected beers. On Saturday, unlimited tasting bracelets will be available at the door for $40.00. Advance tickets are $35 and will get guest unlimited tasting at the Craft Beer tents only; these will be on sale until midnight on Thursday, February 15th. The price will be $40 at the gate/event. Free general admission with $6 beers available at the draft trucks. Click here to buy your tickets online for the festival. Local restaurants and groups competing for “Best Vero Beach Wings” designation will be selling tasty chicken wings to the attendees. Additionally, other Royal Palm Pointe establishments will be selling sodas and kid-friendly food. Live music will be provided by Dave Scott & The Reckless Shots, The Humdingers, The Jacks Band, and Slip & The Spinouts. There will be 800 spaces along the Pointe, with secondary parking and bus transportation from the Parc24 garage on Indian River Blvd, ½ mile south of the event, between the Bridges. 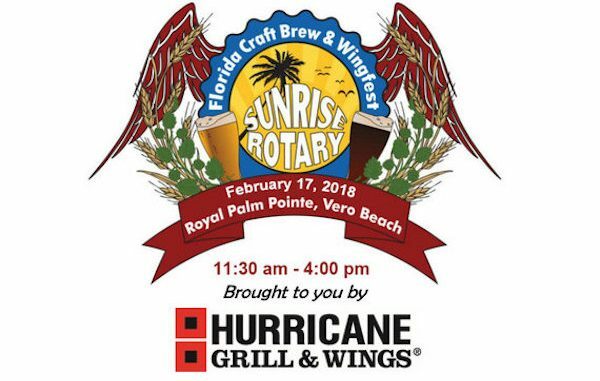 Proceeds from The Seventh Annual Craft Brew and Wingfest will benefit the charitable projects of the Vero Beach Sunrise Rotary Club.